The App is looking good in Closed Beta stage. We are in process of integration with Ring-Ring right now; after a successful integration with Ring-Ring it will be ready to go live. A purpose of the EnergyCoin Dashboard in this phase is to show how friendly you are to the environment. Our goal is to motivate people to behave green, and we want to invite as many of you to do so as well. Our green behaviour partners would feed us with your environment-friendly actions that we would display in our App. Amount of Bicycle Bits you earn from Ring-Ring would be expressed in ENRG, which represents your green behaviour, and your CO2 savings would be stored as carbon credits on the blockchain. Upon a successful registration, login and doing some Ring-Ring activities your Dashboard Page could look like this. 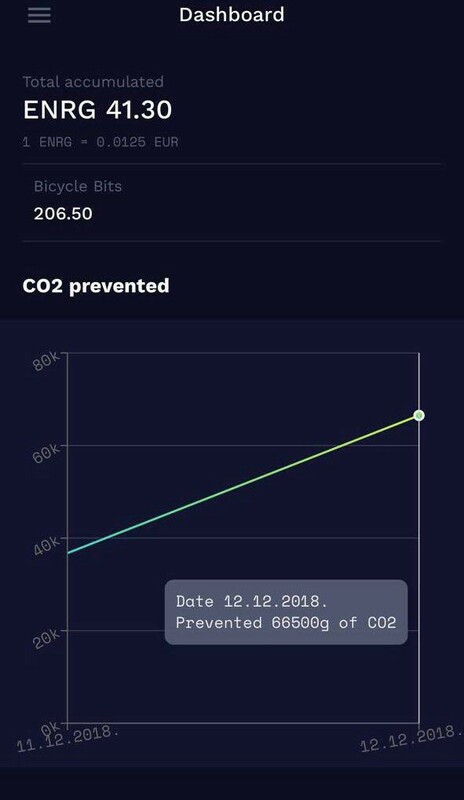 On the dashboard you can see CO2 prevention by riding a bike for every day since you registered. You can follow your green behaviour in ENRG and/or Bicycle Bits, and value of ENRG in Euro. App will be free to use!